Conservatives are blaming “gun-free zones” for the Roseburg massacre. Seriously. Former Arkansas Gov. 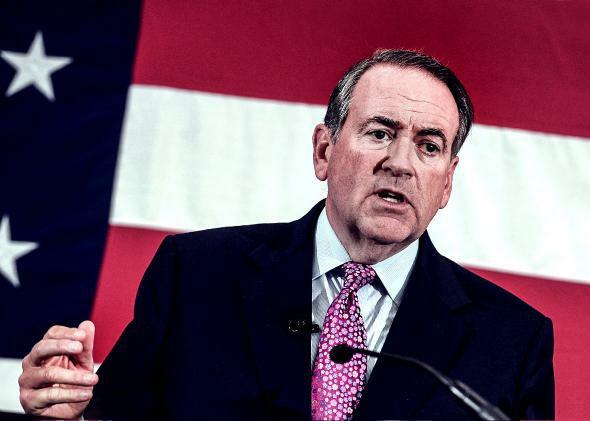 Mike Huckabee speaks on April 18, 2015, in Nashua, New Hampshire. Photo illustraion by Juliana Jiménez. Photo by Darren McCollester/Getty Images. President Obama’s speech following Thursday’s mass shooting at an Oregon community college was the most dumbfounded of his presidency. Over 12 minutes, he surveyed America’s absurd gun politics—in which an outspoken minority always gets its way over a numbed majority—and asked, exasperated: What the hell? The press releases Obama predicted required a bit more time, but the tweets did not. Here was Rep. Jeff Duncan, a Tea Partier from South Carolina, feeling comfortable enough not just to make the argument, but to do so with sarcasm and emojis. The polling on gun laws is more mixed than either side of the debate would care to admit. A Pew Research Center survey conducted in July and reported in the Hill found that 88 percent of Americans “favor expanding background checks, up slightly from the 81 percent of Americans who supported the measure in May 2013.” The poll also found, though, that the public is largely polarized—and talking past one another, really—on the more fundamental views of gun ownership. “Currently, 50% say it is more important to control gun ownership, while 47% say it is more important to protect the right of Americans to own guns,” Pew wrote. A 2014 Pew survey showed that more and more people are buying into the argument that more gun ownership is necessary to protect safety, too. “Nearly six-in-ten Americans (57%) say gun ownership does more to protect people from becoming victims of crime,” Pew found, “while 38% say it does more to endanger personal safety. In the days after Newtown, 48% said guns do more to protect people and 37% said they placed people at risk.” The percentage of Republicans who said “gun ownership does more to protect people from becoming victims of crime” jumped from 63 to 80 percent between December 2012 and December 2014. These views aren’t necessarily in conflict. One might believe that more stringent federal background checks and other precautionary measures should be enacted to prevent the mentally ill from obtaining firearms while, at the same time, the rights of “everyone else” should remain unfettered. That may constitute a majority position that President Obama could work to push incremental change. But it’s a passive majority relative to the very vocal minority of gun rights activists who see any new gun control legislation as a slippery slope toward confiscation. In our system of government, with its many veto points, a vocal minority will always beat a passive majority. Only a very small percentage of Americans consider gun control a major priority when considering how they’ll vote. The people who do strongly factor guns into their calculations are those who fear the government taking their guns away. When gun-control legislation is introduced on the federal level, gun rights activists, and organizations like the National Rifle Association, successfully mobilize to pressure lawmakers into stopping it. Correction, Oct. 2, 2015: This story’s headlines originally misspelled Roseburg, Oregon.